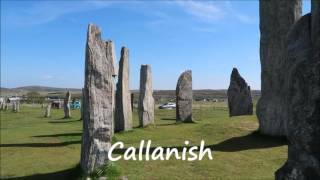 We visited Arran a couple of years ago and had an amazing holiday. 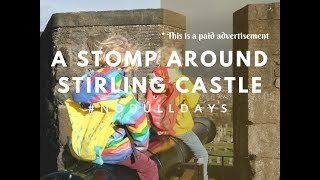 There’s so much to see from standing stones and castles, to wildlife and delicious foods. We definitely want to go back again soon! The great thing about Arran is that there really is so much to do and the children will never be bored. Now our boys are bigger we would definitely bring bikes, but there are also plenty of walks too. You can visit stone circles on Machrie Moor or walk along to King’s Cave where Robert The Bruce allegedly stayed. 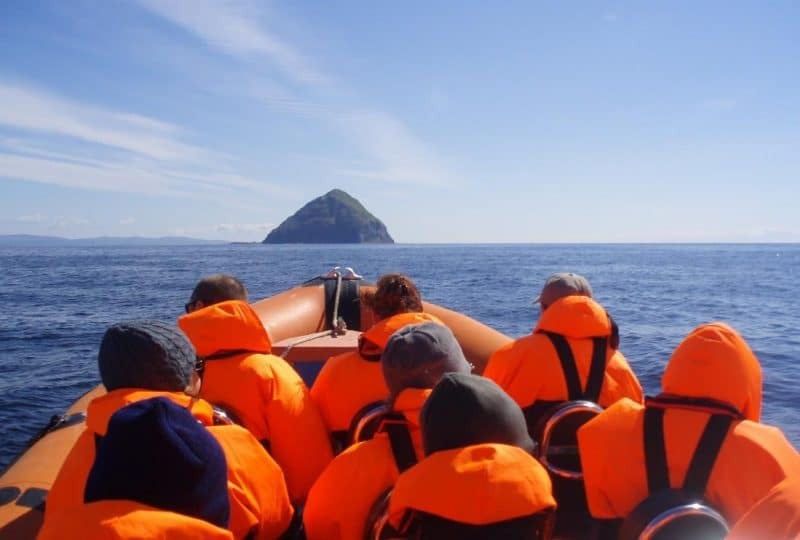 A visit to the Heritage Museum is a good starter when visiting the island, it will give you a great background to the history, geology and people. 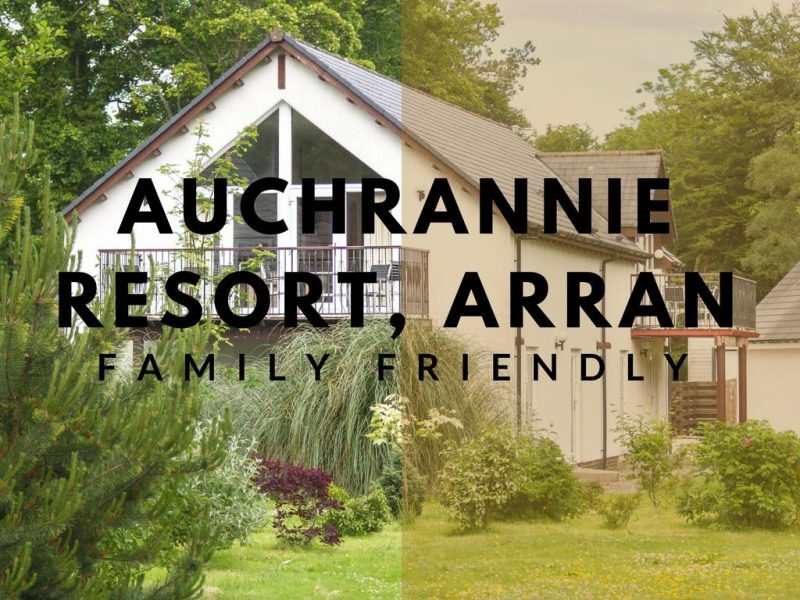 But first you need to decide where to stay, and what would be better than a family friendly resort like Auchrannie? 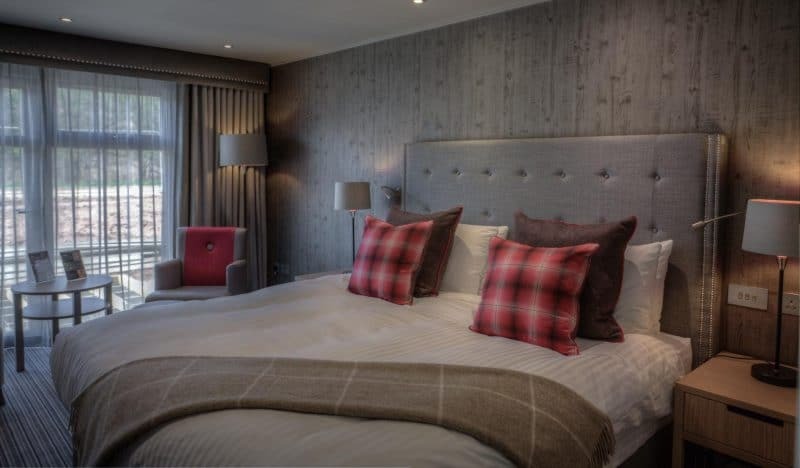 Only a mile from the ferry at Brodick is the Auchrannie Resort, which is a 4-star hotel with 84 rooms and 30 5-star luxury lodges. Sometimes it’s nice to stay somewhere a bit more luxurious, especially when it’s in such a beautiful destination like the Isle of Arran. 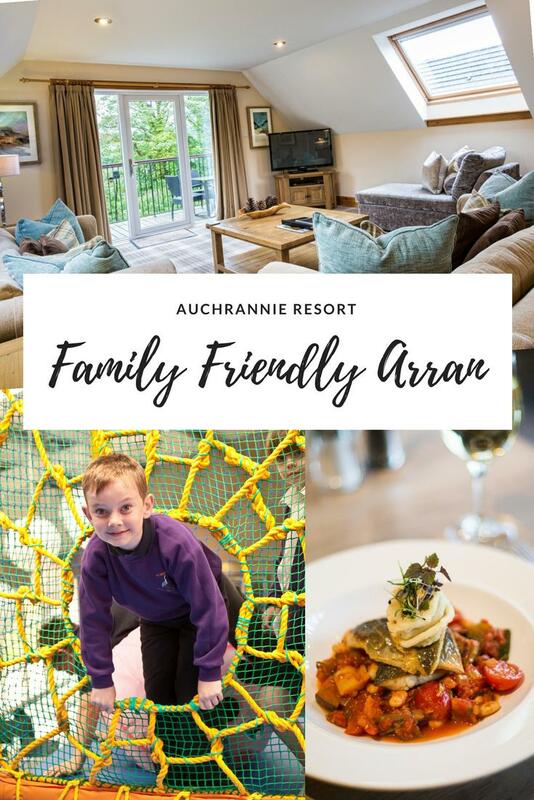 The Auchrannie Resort is a fantastic family friendly resort, with large contemporary standard rooms that can sleep families of up to 5 (which is refreshing for those larger sized families!). Superior top floor rooms have amazing views and along with the double/twin beds there are bunk beds for the children. Or stay in one the most luxurious Executive suites with super king-sized bed, stunning bathroom, private balcony, large lounge area and a separate bunk room for the kids. I love that all resort hotel rooms have access to resource rooms with microwave, nappy bins, washing machines and ice machines (always a sign of a well designed hotel!). Plus there are guest lounges available for a little relaxation on the comfy couches and outdoor terraces. If you would prefer a fully self-catering option then the luxury lodges may be a better bet? They are a home from home and you can choose from 2 or 3 bed lodges, sleeping up to 8 people. Ideal for larger families and groups. The lodges are only a short walk from everything that Auchrannie has to offer, so you will be able to enjoy the whole resort. There are 3 different dining options at Auchrannie. All 3 offer freshly prepared food from local ingredients and have children’s and allergen menu’s available. There are also plenty of vegetarian and vegan dishes too. I personally want to try Brambles Seafood & Grill as I’m a huge fan of seafood. Plus my meat loving husband will enjoy the grilled meats with the exciting range of specials available. 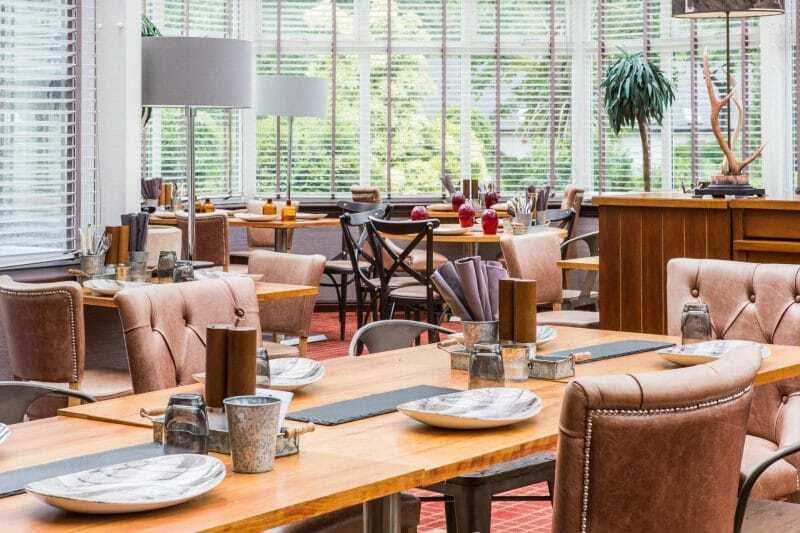 However, I think as a family the Cruize Bar Brasserie would be a great spot for family dining, with their little soft play area to keep little ones occupied and a games room for older kids. And that’s just the entertainment! 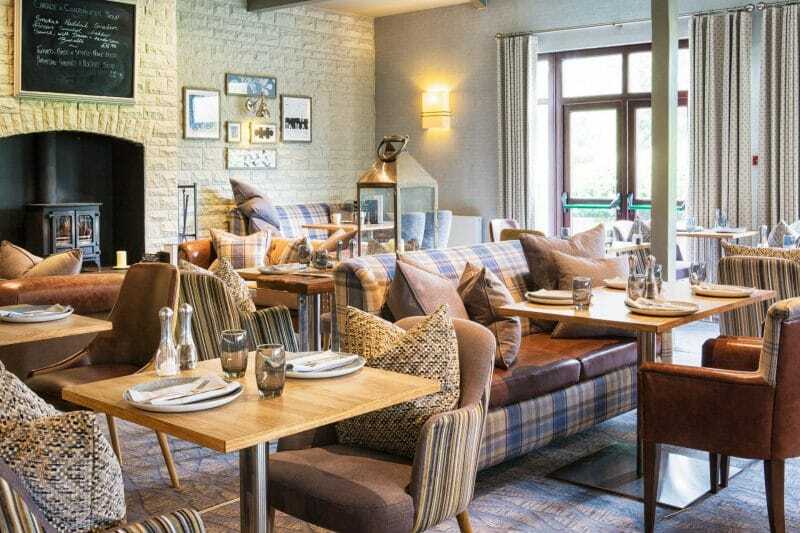 They have freshly prepared homemade pizzas, pasta and steak & burgers, plus a wide ranging children’s menu. 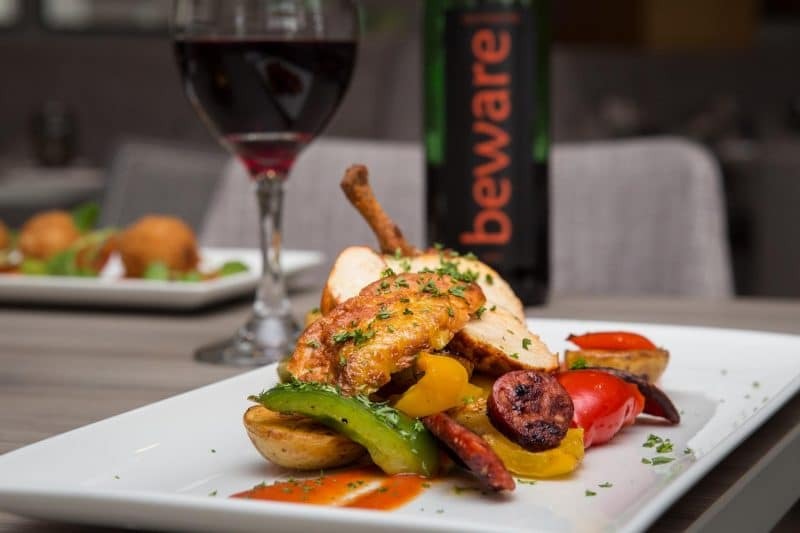 Or why not try something more Scottish in the stunning Eighteen69 glasshouse overlooking the gardens, which has Scottish themed tapas to choose and share. I know from experience that picking food from sharing palates is much more fun for little tummies! With food and board all catered for you then need to think about entertaining your little troop. 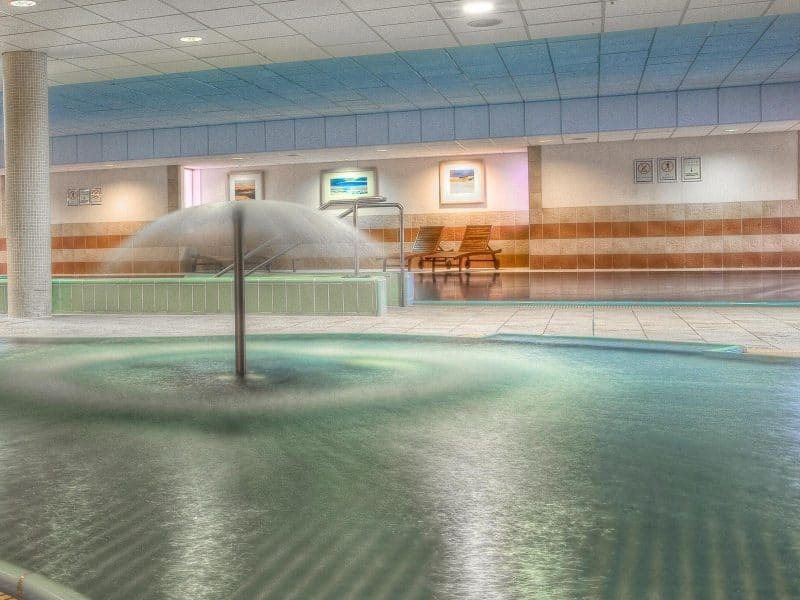 Our two always love water play and would be excited to know that there are two swimming pools, one at each leisure club on-site, plus saunas, steam rooms and health suites for us adults to relax in. 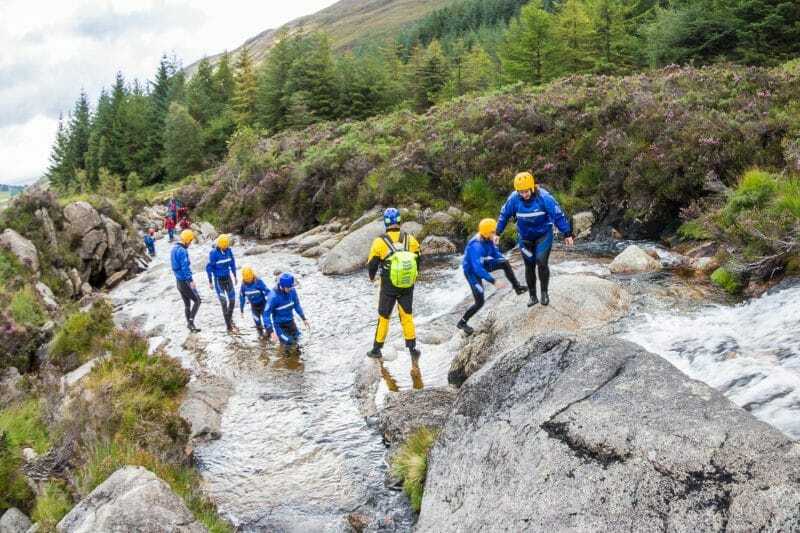 If you prefer more adventurous activities then Arran Adventure will be right up your street, with a huge variety of activities from archery, Segways, gorge walking and mountain biking. 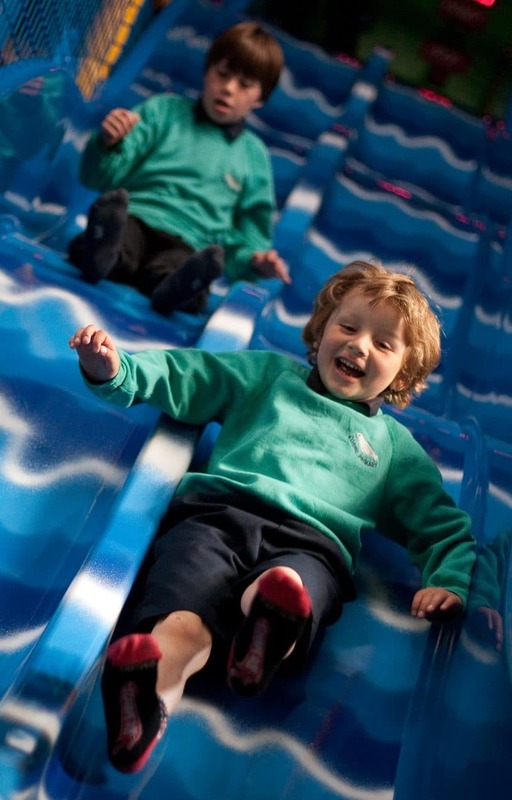 Younger children will love the Playbarn with its 3 tier indoor soft play area, sandpit and picnic area, plus big screen TV’s (and WiFi to keep the adults busy)! 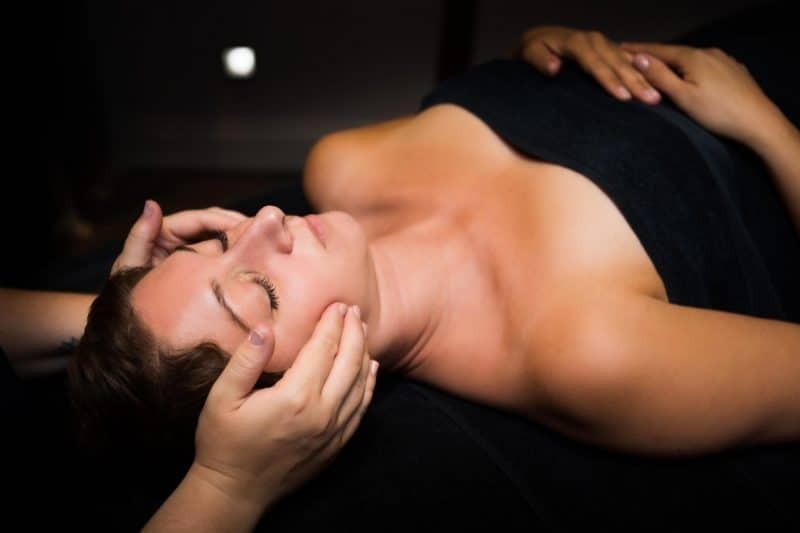 The ASPA offers much needed relaxation for mum and dad as well as pampering treatments tailored for under 16s. Perhaps a treat for older children with mum or dad? When you are ready to explore further away from the resort, the Isle of Arran has plenty to offer. 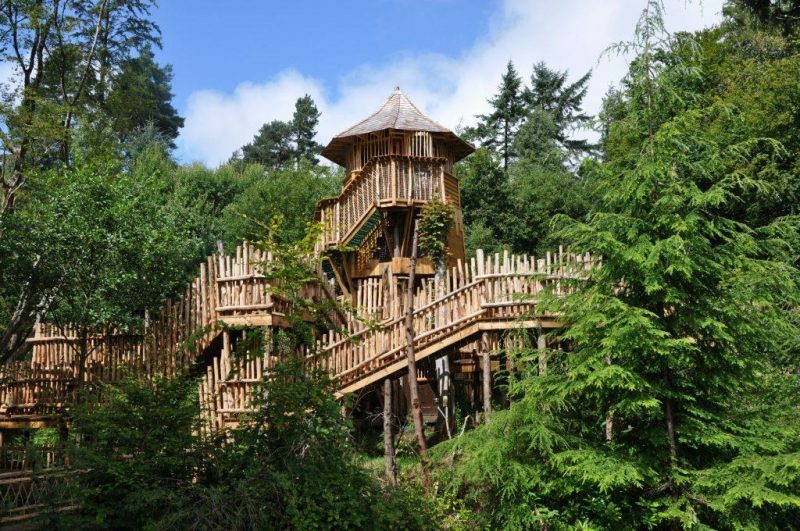 Our kids spent a long time at the adventure play area at Brodick Castle on our last visit. 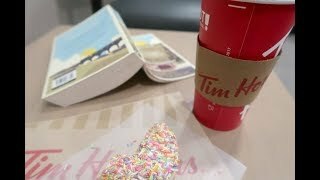 Definitely somewhere we would visit again. Then you can organise a whole host of activities such as abseiling, canoeing, paragliding, horse riding, a rib tour and raft building. Or try a little wildlife watching whilst walking the many paths on moorland or beach. 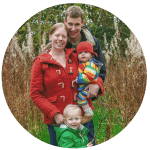 Geocaching is always a fun and budget friendly day out seeking containers called ‘geocaches’ out at specific GPS coordinates (you can even use your smart phone for this!). Any golfers in the family will be pleased to know that there are 7 courses across the island , plus putting greens dotted about the island and even a crazy golf course in Brodick! Although our kids aren’t particularly good at mini golf yet, they certainly love a go, so we will need to visit the crazy golf course on our next visit. 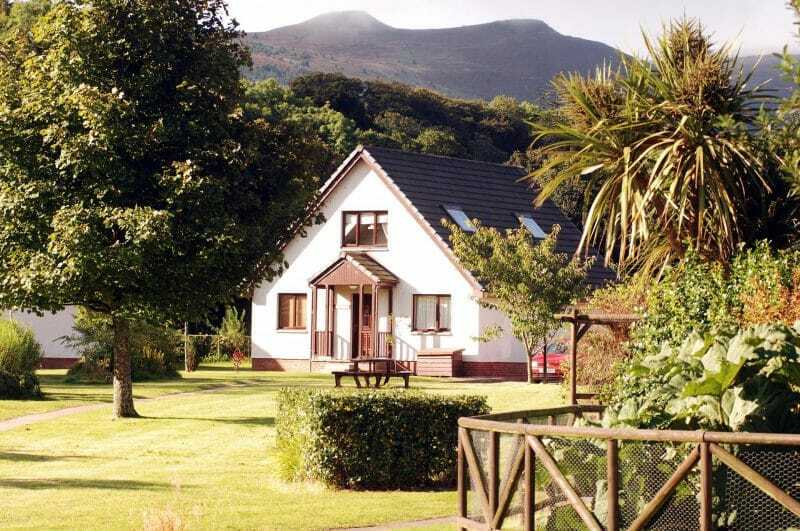 If you want to find out more or book your holiday at Auchrannie Resort on Arran then head over here to book. Just don’t forget to book your ferry tickets afterward too! 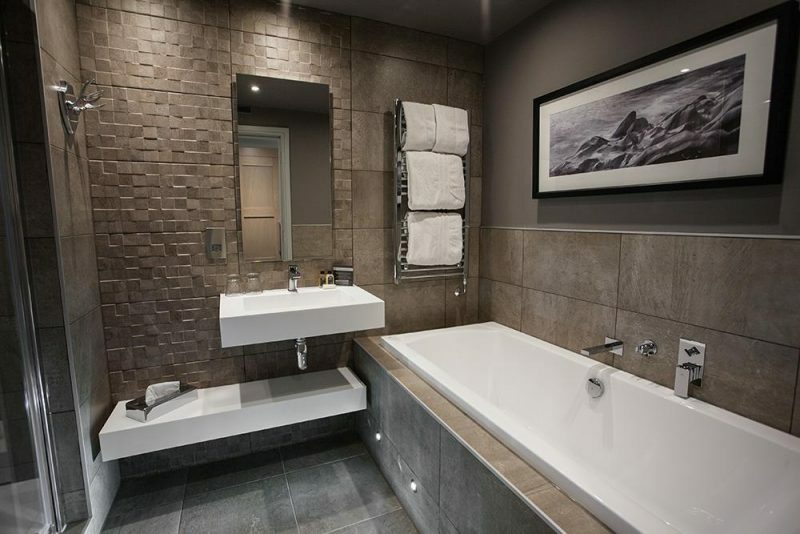 * This is a collaborative post with Auchrannie Resort. 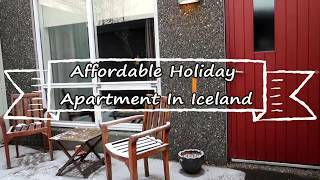 Oh my goodness this is literally our perfect holiday, especially as I know they do dog friendly rooms too! I love how well they cater for children and make them as welcome as the adults. 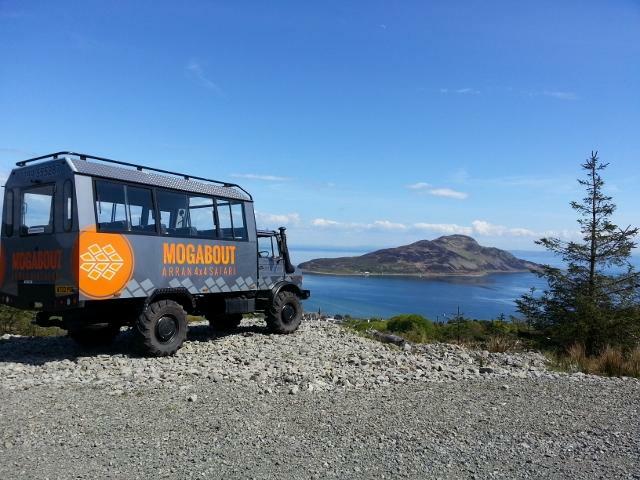 Arran looks amazing with lots of fun things to do. The hotel/resort looks like a wonderful luxurious place to stay!!! It definitely does look amazing doesn’t it!